Saturn on the steering wheel now since at 21 degrees and reaching its destination of 24 degrees soon and in the nakshatra of Poorvashada and Jupiter connected to Venus and the sign Taurus as already explained in my previous article may prove malefic for the Nehru Dynastic Politics “Mars Planet of Energy Violence Explosions It’s Stay In Aries And Taurus : What It Foretells ? Astrologer Anil Aggarwala” https://www.astrodocanil.com/2019/01/mars-planet-of-e…r-anil-aggarwala/ ‎ Read this Text—– Some Previous happenings and against the Nehru Dynastic Politics Took place in 1977 when something of a Revolution happened through ballot box and then Jupiter was in Taurus. In August 1964 again had connection with Aries and Taurus sign when it was about to go in Taurus, Jupiter had taken away Nehru and Brought Lal Bhadur Shastri into Political Forefront. Then When Jupiter was again in Taurus from 1964 to 1966 Jupiter was in Taurus again and For Indira again . Mars the Lagna Lord of the natural Zodiac is at the Moment Vargottam in all the Varga charts and about to join the Aries sign on the 5th Feb. 2019 and would give Modi Courage to rise to the occassion since it will aspect his natal Mars and Moon by strong 8th aspect . In case of Rahul Gandhi, this Mars may not attibute what it has the capacity to give to Narendra Modi. The D-day today has arrived and Prime Minister Narendra Modi and his BJP-led NDA Government will face a litmus test in form of the Union Budget. 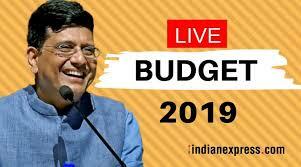 Union Finance and Railway Minister Piyush Goyal will be presenting the Budget speech 2019 in the absence of Arun Jaitley who is not well. At the fag end of its tenure,the Modi government wants to present a budget that not only stumps the opposition but also woos voters ahead of the Lok Sabha elections 2019. Traditionally, the governments refrain from presenting a full budget and instead table an interim Budget or vote-on-account. The Union Budget Speech 2019 by Piyush Goyal is likely to begin at around 11.00 AM on February 1. Major TV channels .. The Day is Friday and the Lord is Venus and as the Lord of the 2nd House placed in the 9th house with Moon and the 10th and the 11th Lord is most benefic for the Govt. spending wealth for the benefit of the Country . Moon, Venus and very close to Lagna Degrees and hence we can see the impact of the same . Lagna is movable hence there is a change on the cards for the Country in the Union Budget for positive stance. Lagna Lord is Mars Vargottam and placed well in all the shadvarga charts and has aspect of Jupiter on it hence the the Govt. will spend money and give relief on the deserving cause for the benefit of the Country and the masses of the country. Lagna Lord in the 12th house vargottam is also indicationg that the Modi Govt. is trying to put their feet in the shoes of the masses and see where the shoe pinches. Benefics aspect Lagna Lord the good effects can be seen to a 75 % as per astrology. The Govt. will gain immensely since the 10th Lord is placed in the 9th house with Moon and the 2nd Lord Forming Dhan Yogas. Sun and Mercury Forming Budhaditya yoga , Victory for the Govt. and relief for the Buisnessman and Traders . 12th house Mars also Causes division in (Army) the Oppositions and in the Gathbhandan Parties it so seems, specially when the Moon is also in the Krishna paksh.